Over 300 Meskhetian (Ahiska) Turks from a Turkish-speaking minority region in eastern Ukraine arrived in Turkey Friday to live under the country's asylum measures adopted in April last year. Two Turkish Airlines planes carrying 334 people from the Ukrainian city of Sloviansk departed from the Kharkiv International Airport and landed in eastern Erzincan province, where they will be provided with furnished apartments at a residential complex built in Uzumlu town by the Turkish government. The transfers have been initiated upon the instruction of Turkish President Recep Tayyip Erdogan and the coordination of Turkish Prime Minister Ahmet Davutoglu. Ahiska Turks began settling in the town since December last year. The first group of Ahiska Turks arrived in Uzumlu on Dec. 25, followed by a second group on March 3. The first part of the third group comprising 171 people arrived Thursday. Friday’s transfer of 334 people is considered second part of the third group. The total number of Ahiska Turks so far settled in Turkey is 1,121. World Ahiska Turks Association Secretary General Fuat Ucar said a fourth group, including 110 families would arrive in June. “We are planning to welcome the last and fifth group in August,” Ucar said, adding that 595 families, including around 2,900 people would be settled in Erzincan by the end of summer. 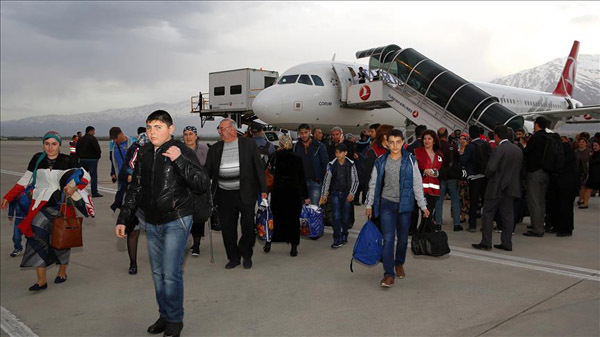 Erzincan Deputy Governor Dede Musa Basturk, Assistant Governor Ahmet Turkoz, Deputy Mayor Ertan Buyruk, and several other local officials welcomed the group at the airport, who were taken to Uzumlu by buses after completing customs procedures. Ahiska Turks fled their homes during the recent conflict between Ukrainian forces and pro-Russian separatists in the eastern region of Ukraine, of which Sloviansk city was a part. Last April, Turkish Council of Ministers enacted measures allowing at least 3,000 Ahiska Turks to be legally accepted by the Turkish government as asylum seekers. Ahiska Turks, also known as Meskhetian Turks, were expelled in 1944 from their homeland – the Meskheti region in Georgia – by Soviet leader Joseph Stalin, in an attempt to remove Turks from the shores of the Black Sea. They faced discrimination and human rights abuses before and after deportation. Those who migrated to Ukraine in 1990 settled in shanty towns used by seasonal workers. The Organization of Islamic Cooperation (OIC) on Friday welcomed the adoption of the "Strategy for the Repatriation of Meskhetians" by the Georgian government in 2014. In a final communique issued at the end of the two-day summit in Istanbul, the organization also urged further adoption of a comprehensive plan with a view to facilitating the return of Ahiska Turks and their integration into Georgian society. Nalan Dal: “When I sincerely wanted to do something for humanity, Allah blessed me in this field"